NASHVILLE — The Ottawa Senators earned a point for the sixth straight game Saturday with a 2-1 shootout win against the Nashville Predators on Saturday at Bridgestone Arena. Mika Zibanejad scored on a wrist shot low to the blocker side in the first round for Ottawa, and Jason Spezza scored on a wrist shot in the second round. Senators goalie Craig Anderson stopped Craig Smith with a toe in the first round also turned aside David Legwand in the second. Ottawa had to kill a penalty over the final 1:36 of overtime to get to the shootout after defenseman Marc Methot was called for holding the stick. Ottawa (20-18-8) has points in six straight (5-0-1) and in eight of its past nine (6-1-2). The Senators are 2-5 in the shootout, with Anderson 2-2. Nashville (19-20-7) is 3-2-3 in its past eight. The Predators fell to 0-5 in the shootout, with rookie goalie Marek Mazanec 0-3. Nashville has scored one shootout goal (by Legwand) in 20 chances this season. Some physical play helped wake up the Predators and tie the game. Eric Nystrom and the Senators’ Colin Greening engaged in a protracted fight at 15:00. Then Rich Clune put a hard hit on Ottawa’s Jared Cowen that resulted in a boarding call, but Senators captain Jason Spezza took exception and dropped his gloves and started hitting Clune. Spezza earned a roughing penalty, and Nashville capitalized on the 4-on-4. The goal came from former longtime Senators forward Mike Fisher. Ryan Ellis cranked a slap shot from the high slot but it deflected off Senators forward Mika Zibanejad and caromed directly to Fisher, who whisked the puck in from the doorstep at 3:00. The point was Fisher’s 11th in the past eight games, his fifth goal during that span. It was his 12th goal of the season, moving one behind Craig Smith for the team lead. Ottawa took a 1-0 lead at 6:23 of the second period capitalizing on a miscue by Predators defenseman Mattias Ekholm. 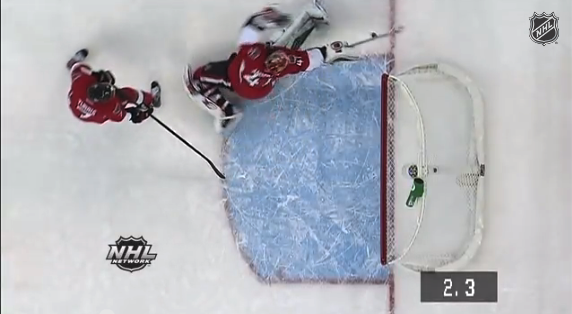 He reversed the puck behind his net but no one was there for it except for Ottawa center Kyle Turris. He shot the puck into the net before Mazanec even moved from the opposite post. Nashville failed to score on a first-period penalty shot. Viktor Stalberg earned it when Ottawa defenseman Joe Corvo tripped him from behind. (Coincidentally, Stalberg had just come out of the penalty box for tripping Corvo.) Anderson made a glove save on a relatively mild wrist shot.